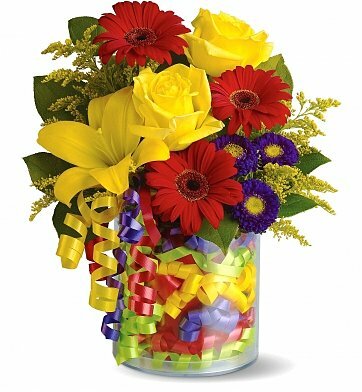 With its colorful curled ribbons and cheerful flowers, this festive arrangement is like a birthday party in a bouquet. Fragrant flowers such as yellow roses and Asiatic lilies are arranged with gerberas, miniature carnations, and asters in a vase that is lined with a hand-curled ribbons in a rainbow of colors. Bright and beautiful, the bouquet is the perfect gift for sending a smile. Arrives in a stylish acrylic ribbon vase. Measures approximately 12" x 14". Birthday Ribbon Bouquet is a hand delivered gift. These gifts are delivered by one of our local design centers located throughout the United States and Canada. Same day delivery is available for most gifts when ordered before the cutoff time. The cutoff time for Birthday Ribbon Bouquet is 2 PM in the recipient's time zone. It turned out more beautiful than I expected. My friend was thrilled with it. Thank you. I received a photo from my Mom after she received her Birthday Bouquet and it was as beautiful as the photo on the website. Being out of state, I worried about the quality and I did not need to. Thank you! I got a call from my sister as soon as this was delivered (right on time). She was very pleased. Easy to order, I live out of state. Delivered as requested, on time and lovely. The flowers were delivered and they were positively received by the recipient.